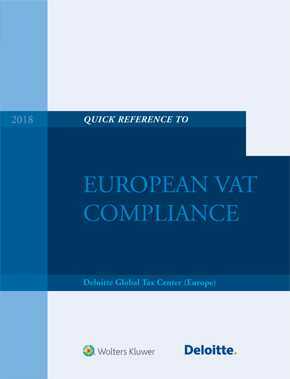 Quick Reference to European VAT Compliance provides the information necessary to deal with common compliance challenges via a format that allows readers to readily locate pertinent guidance when needed. This highly practical reference distills the problem-solving process by anticipating the relevant challenges and providing reliable help. - Detailed, country-specific VAT compliance profiles for each EU Member State plus Iceland, Norway and Switzerland. Authored by the experts at Deloitte's Global Tax Center (Europe), Quick Reference to European VAT Compliance is an indispensable tool for professionals seeking to proactively manage VAT compliance.